Ball bearings are used widely in instruments and machines in order to minimize friction and power loss. While the concept of the ball bearing dates back at least Leonardo da Vinci, their design and manufacture has become remarkably sophisticated. In the following we shall review their basic characteristics. 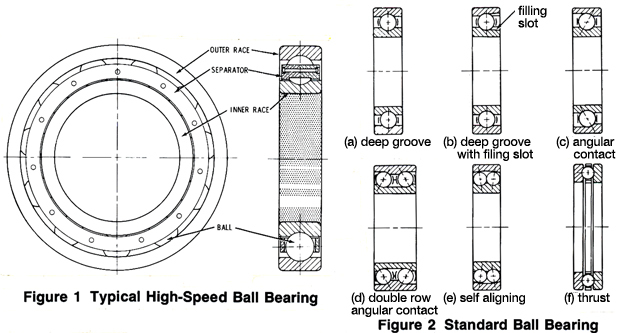 "A typical deep-groove ball bearing designed for high-speed operation is shown in Figure 1. In this bearing, the separator serves to keep the balls from rubbing against one another as is piloted on the inner race OD. Alternatively, the separator may be piloted by the rolling elements or by the outer race ID. Where rotative speeds are low, the separator often is omitted. The rolling elements may take many forms — cylinders, balls, tapered rollers, barrels, or very slim rollers known as needles — and the whole bearing name is generally taken from this form. 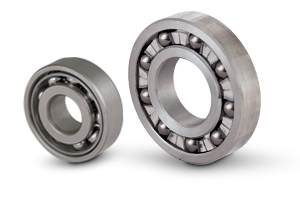 There are several types of ball bearings that fit specific needs. 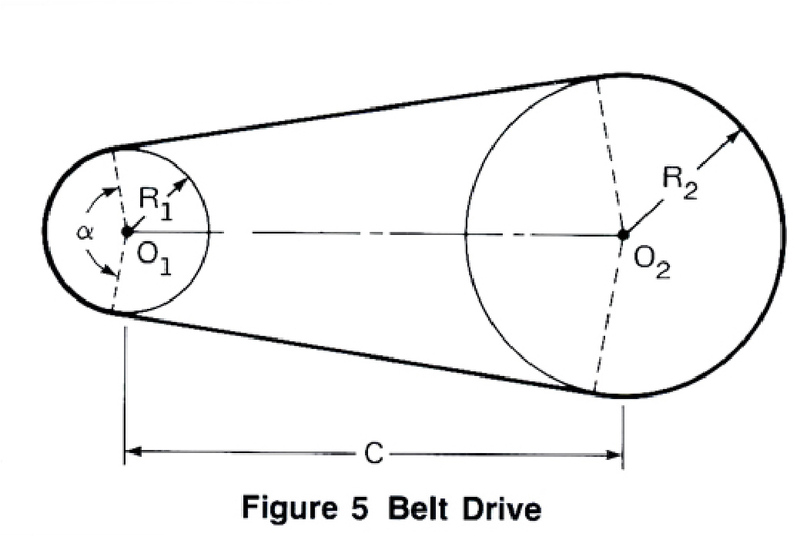 The deep-groove ball bearing, Figure 2(a), is the most versatile. Radial loads and thrust-load capacities may be approximately equal in this bearing. When it has the proper separator, it is very good for high-speed operation. At low speeds, no bearing separator is required; at intermediate speeds, a ball control separator of steel-ribbon construction is adequate; while the ultimate high-speed performance is obtained with a race controlled (or piloted), fully machined separator. Since balls are assembled into the bearing by eccentric displacement of the races the number of balls in this type of bearing is limited. More balls can be introduced into the bearing if a notch is machined into one of the races, Figure 2(b). Radial load capacity is higher in this bearing than in the standard deep-groove construction, but high-speed performance and thrust-load capacity is impaired. When large thrust loads in one direction are coupled with radial loads, angular contact ball bearings, Figure 2(c), are usually superior. Most high-speed and precision spindles use axially preloaded pairs of these bearings. Preload is controlled by the length of the spacers, which determine axial location of the races, or by mounting the bearings against one another in a "back-to-back" or "face-to-face" fashion. The double-row, angular-contact bearing, Figure 2(d), is a simpler arrangement from the standpoint of the user. The preload is built into the bearing at the factory. In contrast th the previously discussed bearings, in which alignment is a very critical item, the self-aligning ball bearing, Figure 2(e) by virtue of the spherically ground outer race can tolerate considerable misalignment of shaft and housing. On the other hand, load-carrying capacity is reduced due to the high contact stresses that result from the large difference in curvature between the balls and the outer race. The thrust ball bearing, Figure 2(f), is adaptable to large thrust loads that have almost no radial component. Very large sizes of this bearing are used in gun turrets and large earth moving machinery"
* With the permission of the American Society of Mechanical Engineers, 345 East 47th Street, New York, New York 10017. Bearing selection represents a compromise among many factors including the nature of the application, performance requirements and cost. 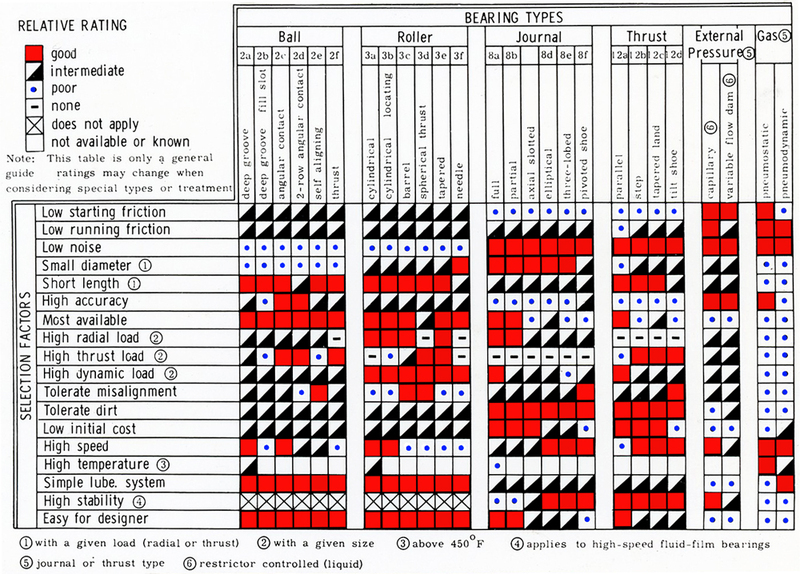 A useful bearing-selection chart, which summarizes the principal considerations involved, has been given by A.O. DeHart and is reproduced in Table 1. For more details, which are beyond the scope of this presentation, the reader is referred to technical literature. The first step in sizing a suitable ball bearing for a given application is the determination of the loads which support. In this section we list some of the most frequently occurring mechanical configurations and the bearing loads imposed by them. Note: In the case of chain drives the bearing load is often approximated by the pull on the tight side of the chain, the slack side being assumed tensionless. The bearing load on the camshaft bearings due to load, P, can be determined according to Cases (a) or (b), if the camshaft is supported by two bearings. The bearing load on the camshaft bearings due to the load, P, can be determined according to Cases (a) and (b), if the camshaft is supported by two bearings. Note that the force P in the above two cases is equivalent to a radial force, P, together with a torque about the cam axis. We consider here only the case of helical gears on parallel shafts. (ii) The direction of the thrust load is determined by the condition (see Figure 12) that the vector sum of the radial force and the thrust load is normal to the helix. This implies that reversal of rotation causes reversal of thrust. The thrust load in the case of helical gears implies that the bearings be capable of carrying both the radial load and the thrust load. The calculation of the radial bearing load in the case of shafts with two bearings can be obtained from Cases (a) and (b). Again we note that since action and reaction are equal and opposite, the three orthogonal force components F, FR and FT act on gears (and shafts), but in opposite directions. Note that the direction of F (in all gear drives) depends on the direction of rotation of the driving gear. The thrust loads FTG and FTP are components of the tooth separating force, which must be taken up by both pinion and gear bearings. The directions acting on the gear and the pinion are opposite. 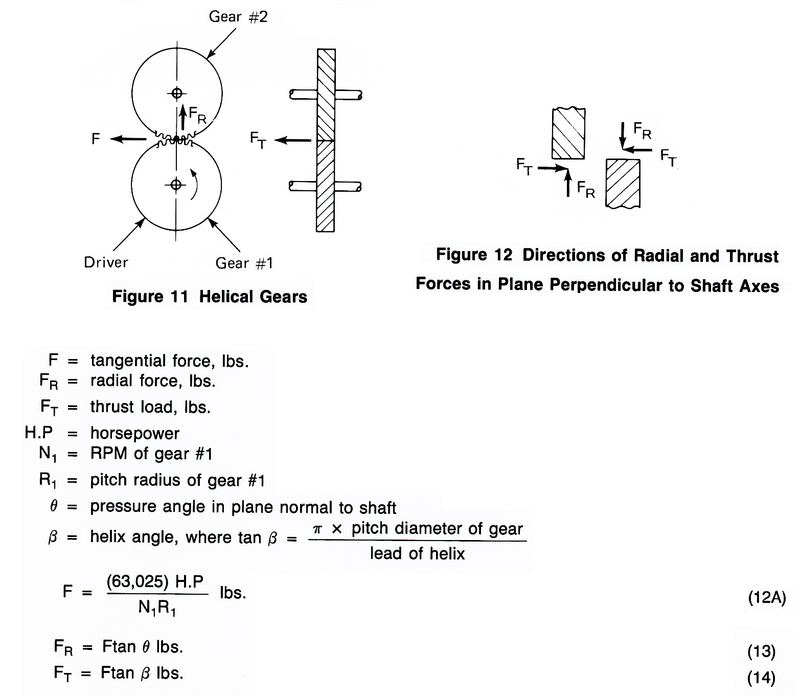 Total bearing force on each gear is the vector sum of three forces: tangential, gear thrust and pinion thrust. These forces are shown in Figure 14. 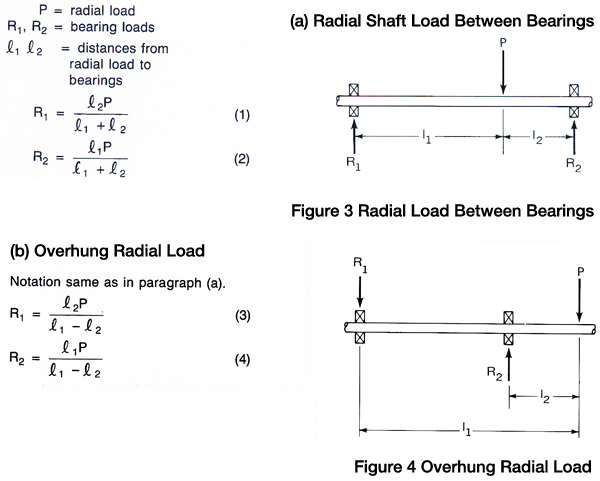 With the aid of these figures the radial bearing loads for shafts with two bearings can be obtained from Cases (a) and (b). The presence of thrust loads again necessitates axial takeup capabilities in bearings. Note that the direction of F depends on the direction of rotation of the worm. The three force components, F, FR and FTW must be taken up by both worm and gear bearings. The directions acting on the worm gear and worm are opposite. 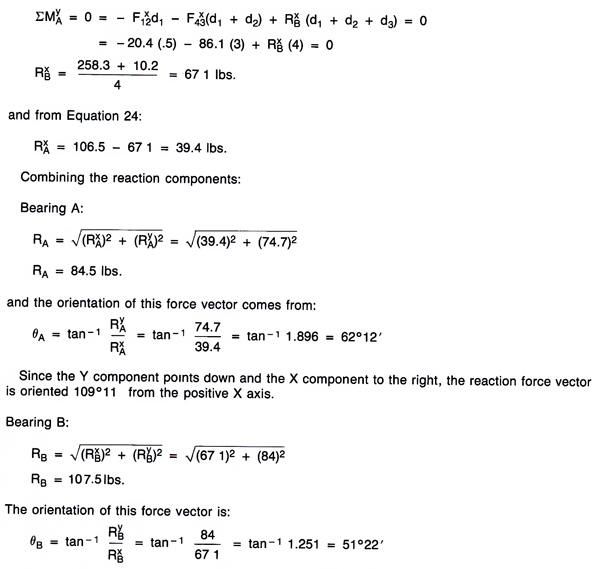 Total bearing force on each member is the vector sum of these three forces. 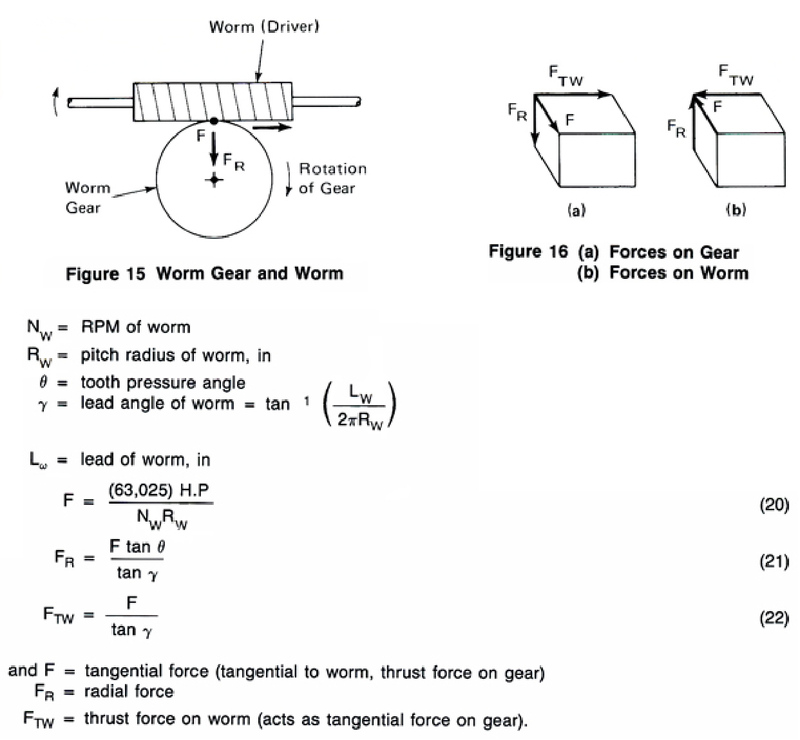 With the worm as driver and the gear rotating as shown in Figure 15, the direction of these forces on each member are shown in Figures 16a and b. With the aid of these figures the radial bearing loads for shafts with two bearings can be obtained from Cases (a) and (b). Once again both thrust and radial forces need to be taken up by the bearings. 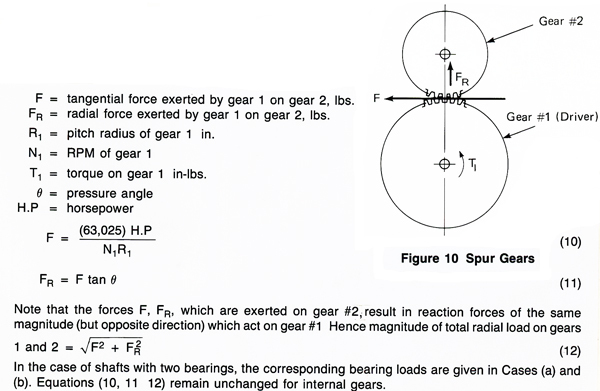 As an example of the bearing-reaction calculations for an entire gear train we consider the spur-gear train shown in Figure 17. The gear train shown in Figure 17 transmits 1/20 horsepower. Shaft S-1 is the driver. If shaft S-2 rotates at 100 rpm CW as shown, what are the bearing reaction forces on Shaft S-2? Where the double subscripts designate transmission of forces between members. 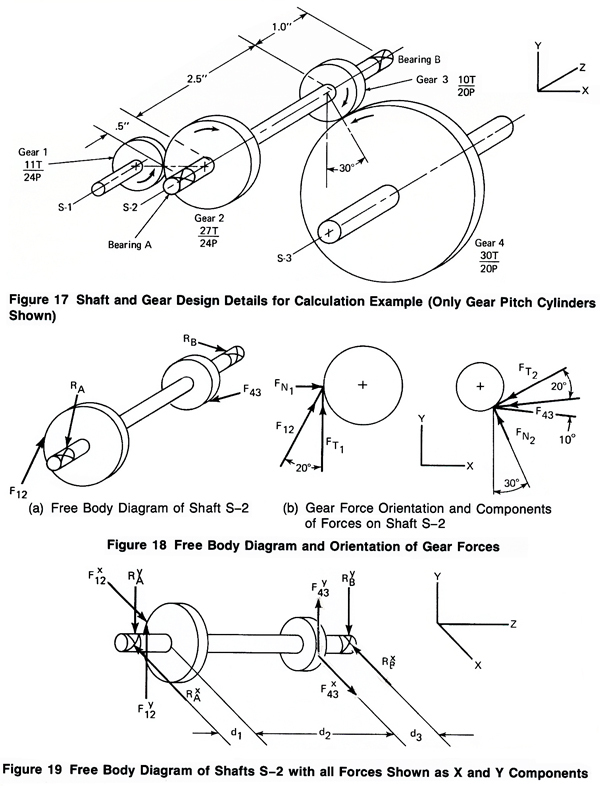 For example, F12 means the force of gear 1 on gear 2. 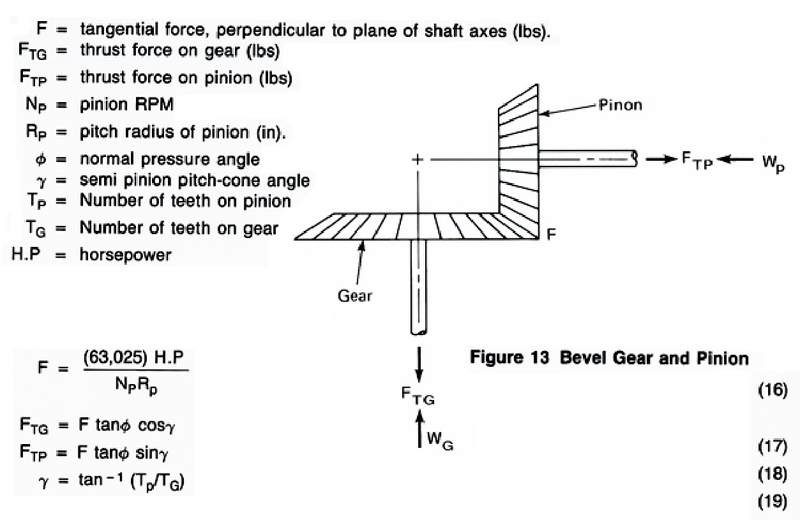 The above contact tooth forces plus the bearing reaction forces hold the shaft in equilibrium as pictured in Figure 18a. Resolving all forces into X and Y components, as shown in Figure 19, the equilibrium equations can be applied. Because of the particular shaft orientation given for this problem the X and Y components of contact force F12 are the tangential and normal components, but this is not true of F43 which is inclined 50° to the X axis. Thus, there are 4 unknowns and two equations. However, if the moment equilibrium equations are written, the unknowns can be reduced. Note that the sign of is negative. This means its direction is actually opposite of that assumed in equilibrium Equation 26. Thus, in Figure 19 component should be drawn in reversed direction to that shown. Conversely, component has a positive sign, so its' direction assumed for the equilibrium and Figure 19 is correct. 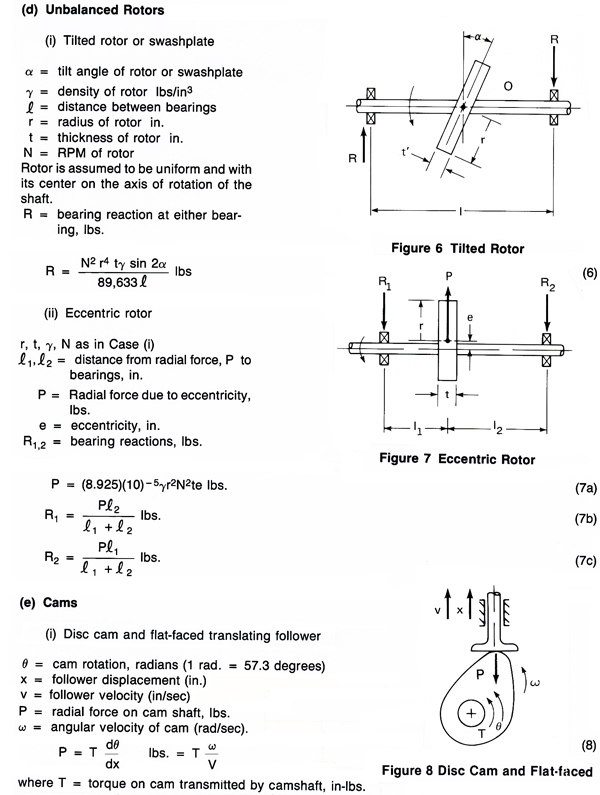 The resultant bearing reaction forces and orientations are pictured in Figure 20. In the course of many years of experience with ball bearings and extensive testing, it has been found that the prediction of the load capacity of a ball bearing is a statistical event related to the fatique life of the bearing. This makes the sizing of ball bearings more difficult than that of many other machine elements. "Life Criterion. Even if ball bearings are properly mounted, adequately lubricated, protected from foreign matter, and are not subjected to extreme operating conditions, they can ultimately fatigue. Under ideal conditions, the repeated stresses developed in the contact areas between the balls and the raceways eventually can result in fatigue of the material which manifests itself as spalling of the load carrying surfaces. In most applications the fatigue life is the maximum useful life of a bearing. This fatigue is the criterion of life used as the basis for the first part of this standard." The material in the standard which follows assumes bearings having non-truncated contact area, hardened good quality steel as the bearing material, adequate lubrication, proper ring support and alignment, nominal internal clearances, and adequate groove radii. In addition certain high-speed effects such as ball centrifugal force and gyroscopic moments are not considered. We now continue with the standard. "Life. The "life" of an individual ball bearing is the number of revolutions (or hours ar some given constant speed) which the bearing runs before the first evidence of fatigue develops in the material of either ring (or washer) or of any of the rolling elements." "Rating life. The "RATING LIFE", L10, of a group of apparently identical ball bearings is the life in millions of revolutions that 90% of the group will complete or exceed. For a single bearing, L10 also refers to the life associated 90% reliability. As presently determined, the life which 50% of the group of ball bearings will complete or exceed ("median life", L50) is usually not greater than five times the RATING LIFE." "Basic Load Rating. The "basic load rating", C, for a radial or angular contact ball bearing is that calculated, constant, radial load which a group of apparently identical bearings with stationary outer ring can theoretically endure for a RATING LIFE of one million revolutions of the inner ring. For a thrust ball bearing it is that calculated, constant, centric, thrust load which a group of apparently identical bearings can theoretically endure for a RATING LIFE of one million revolutions of one of the bearing washers. The basic load rating is reference value only, the base value of one million revolutions RATING LIFE having been chosen for ease of calculation. Since applied loading as great as the basic load rating tends to cause local plastic deformation of the rolling surfaces, it is not anticipated that such heavy loading would normally be applied." (b) Determination of Basic Load Rating. Consider an ABEC 3 single row, radial ball bearing having 10 balls of 1/16" diameter, 0.330" inner race diameter and 0.452" outer race diameter in a single shield configuration. This means that for a load of P =143 lbs. the rating life of this ball bearing will be one million revolutions and 90% of a group of such ball bearings will be expected to complete or exceed this value. Suppose now it is desired to determine the "L10" life of this bearing when operating at 200 RPM and a load of 50 lbs, the life being evaluated in hours of operation. Substituting N = 200, P = 50 and C = 143 into Equation (29), we obtain l10 = 1949 hours. NOTE: L10 is bearing life in millions of revolutions l10 is bearing life in hours. A chart showing required life at constant operating speed has been given by N. Chironis ("Today's Ball Bearings", Product Engineering, December 12, 1960, pp. 63-77, chart on p. 68). This chart is hereby reproduced with the permission of McGraw-Hill Book Company, New York, N.Y. Values of X and Y are given in Table 4. The rating and sizing of ball bearings involve many considerations, many of which are beyond the scope of this introductory presentation. For further information the reader is reffered to the technical literature. For satisfactory operation of ball bearing, suitable shaft and housing tolerances are extremely important. Standard tolerance ranges have been established by the industry and Tables 5 and 6 show recommended deviations of shaft diameters and housing bores from nominal. For normal conditions the recommendations of many manufacturers for rotating shafts and stationary housings, as given by Wilcock and Booser*, recommend fits in the approximate range K5 and J6 for shaft fits, and J6 and H7 for housing fits. A fuller discussion of tolerances and their relation to bearing applications, installation and design is a complex subject beyond the scope of this presentation. This would include considerations involving temperature effects, high-speed operation, shock loading, lubrication, environmental conditions etc. For a discussion of such topics the reader is referred to the technical literature. a. When calculating the basic load rating for a unit consisting of two similar, single row, radial contact ball bearings, in a duplex mounting, the pair is considered as one, double row, radial contact ball bearing. b. When calculating the basic load rating for a unit consisting of two, similar, single row, angular contact ball bearings in a duplex mounting, "Face-to-Face" or "Back-to-Back", the pair is considered as one, double row, angular contact ball bearing. c. When calculating the basic load rating for a unit consisting of two or more similar, single angular contact ball bearings mounted "in Tandem", properly manufactured and mounted for equal load distribution, the rating of the combination is the number of bearings to the 0.7 power times the rating of a single row ball bearing. If the unit may be treated as a number of individually interchangeable single row bearings, this footnote 1c does not apply. Use to obtain C in newtons when D is given in mm. Use to obtain C in pounds when D is given in inches. * Reproduced from "Today's Ball Bearings" by N. Chironis, Product Engineering, December 12, 1960, pp. 68 with the permission of McGraw-Hill Book Co. Inc., New York, N.Y.
Two similar, single row, angular contact ball bearings mounted "Face-to-Face" or "Back-to-Back" are considered as one, double row, angular contact bearing. Values of X,Y and e for a load or contact angle other than shown in Table 2 are obtained by linear interpolation. Values of X,Y and e shown in Table2 do not apply to filling slot bearings for applications in which ball-raceway contact areas project substantially into the filling slot under load. For single row bearings when Fa / Fr ≤ e, use X = 1, Y = 0. * Reprinted by permission of the American National Standards Institute, 1430 Broadway, New York, N.Y., 10018 (force ANSI-AFBMA Std. 9-1978).